Miamikiteboarding is organizing yet another great event this year. The MIAMI KITEBOARDING MASTERS will take place on April 12 & 13th 2008 in Crandon Park and it will include the well-known and established annual KITE FOR GIRLS for its 5th season. The MIAMI KITEBOARDING MASTERS will run in parallel to a Major Wakeboard event BOARDS UP MIAMI that is taking place in the marine stadium along the Rickenbacker Causeway. Both events will bring a huge cross over market of all water sport oriented enthusiasts. Distance or Buoy Race for Amateur series open to all men, women of all ages. ·	Full time Video crew will be on site for the on land interviews as well as close action shots and a Helicopter for aerial video. The video will be released shortly after the event. Magazines, Internet TV, Telemundo and more to be confirmed. For reviews of great videos, images and pictures of our previous Kite for girls editions, check this link www.kiteforgirls.com. Last edited by RickI; 03-30-2008 at 07:53 AM. MIAMI KITEBOARD MASTERS IS HAPPENING THIS WEEKEND!!!! Saturday 12th & Sunday 13th of April in North Crandon park - Key Biscayne. 11 to 15 knots of wind from the South East is an ideal Side-on direction in Crandon and South West is still straight side to side-off ridable without problems. Cash prize is set at $3500 to be spread between the winners of each contest . Over $10,000 of value in trophies and Equipment rewards for the 2nd and 3rd places and all riders entering the contest. Make sure to Register ASAP and Pay the Entry fee - cheaper online, via the Riders Registration page. - A ticket for the Competitors-only Raffle to win 1 week Stay for 6 at Sea Lane luxuruous Beach Front resort in Bozo beach Cabarete. Riders Meeting is at 10am sharp - we will adjust the schedule each day to run as many races and heats accordingly to the best wind conditions. Plan to be here early as we may expect traffic on the causeway due to the Wakeboard contest 1 mile down the street. There will be food vendor on the beach for the spectators. The Award Ceremony and after-Race Party will be at Joe's TIKI BAR ( ex-Yage club) in Rickenbacker marina . Food and beer will be served at the end of each day. DVD projection of the latest Kitesurfing Movies, and DJ spinning from Kulchak Shok. We see you out there this weekend . What others are trying to merge, we're helping define. TKSMiami.com wants to thank the organizers of the event and all those who attended the event. TKSmiami.com was glad to be part of this event and looks forward in attending many more. 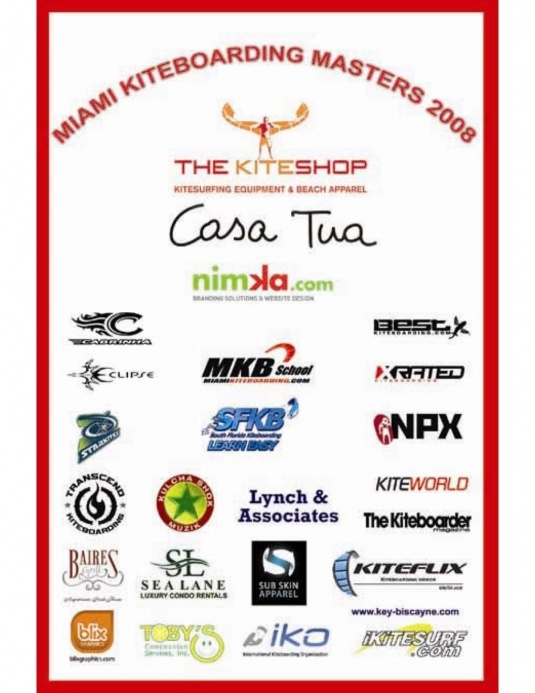 Thank you to all riders and sponsors for participating and supporting our Miami Kiteboarding Masters Event 2008. We had a great turn out once again this year thanks to kitesurfers coming from all over Florida. The wind was good enough to run two races and complete the Buoy Racing Contest with 49 riders on Saturday. 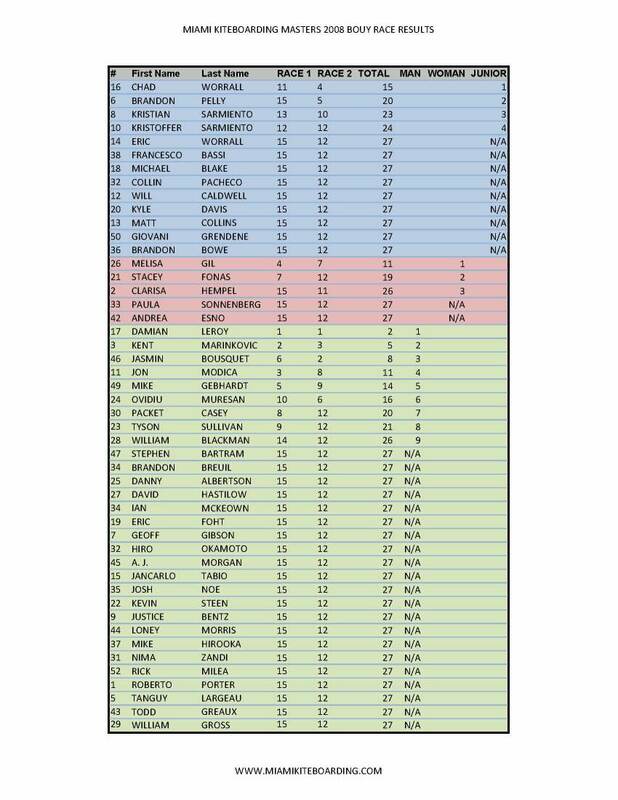 Below are results of the Buoy Race competition. Very mild wind forecast for Sunday 13th forced us to postpone the Freestyle and Kicker contests to next Saturday 19th – weather permitting as we want to have the best conditions for a quality freestyle event. Current wind forecast for coming weekend does not look great at the moment – we will decide by Thursday or Friday if we’ll run it this weekend. SO the ACT #2 of the Miami Kiteboarding masters is yet to come. Therefore all riders registered for the freestyle and kicker contest are still on hold , until the wind cooperates. We are putting a webgallery up right now on the website to display all pictures of the event. If you have your own images that you would like to share, do not hesitate to forward it to us. Check out the forums and event website at www.miamikiteboardingmasters.com for updated information. Have a look to our Sponsors list right here who all contributed to donations, cash prizes, and logistic. Thank you again to support your riding community though event like this one.